COLUMBUS – When it comes to mentors in the coaching profession who Ohio State football coach Urban Meyer quotes, Earle Bruce and Lou Holtz are at the top of the list. With No. 2 Ohio State coming off its least impressive offensive game of the year in a 38-17 win over Indiana last Saturday, Meyer reached into the Holtz quote file when he talked about what will be done this week to improve the offense when the Buckeyes play at No. 8 Wisconsin on Saturday night. “Lou Holtz would say, and it’s forever branded on my heart, that you don’t attack a team when you lose a game. You attack them when they won a game and didn’t play very well. So, we’re attacking them (in practice) and there’s some urgency,” Meyer said on Monday at his weekly press conference. Ohio State (5-0, 2-0 Big Ten) had 383 yards of total offense but got only 93 of those yards on passes against Indiana. Quarterback J.T. Barrett was 9 of 21 for 93 yards, his third-lowest total in 21 starts. The biggest problems were what Meyer called “mis-hits” on deep throws and some poorly run routes by receivers. Wisconsin (4-1, 1-1 Big Ten) won its first four games over LSU, Akron, Georgia State and Michigan State before losing 14-7 to Michigan on Oct. 1. The Badgers did not play last Saturday. Defense has been the foundation of the Badgers’ success. They are third in the Big Ten in points allowed (12.2 a game) but eleventh in points scored (25.6 a game). Wisconsin’s defense will be without two of its top players, though. Linebacker Vince Biegel suffered a broken foot against Michigan and will be out several weeks. Cornerback Natrell Jamerson has not played since a leg injury took him out of the Akron game the second week of the season. “They’re a typical Wisconsin. Team, 6-6 or 6-8 and 315 pounds on the offensive line. They have an excellent running back, a very efficient pass game. They’re outstanding on defense. They’re one of the best teams in America,” Meyer said. — PRAISE FOR DEFENSE: Meyer liked what he saw from Ohio State’s defense against Indiana a lot more than what he observed on offense. The Buckeyes held IU to 99 yards rushing and 281 yards overall. “The defense played outstanding,” Meyer said. — CAMPBELL LIKE SPENCER? 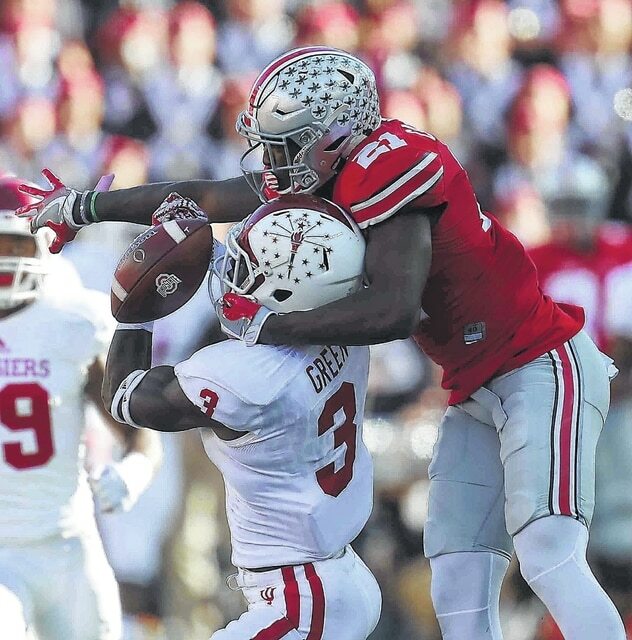 : Meyer compared sophomore receiver Parris Campbell to Evan Spencer, who was regarded as an unsung hero on the 2014 national championship team for his blocking and other things that didn’t show up in the statistics. — BY THE NUMBERS: Ohio State has won its last 19 games on an opponent’s home field since Meyer became its head coach. The last road loss was at Michigan in the final regular season game in 2011. It has won 12 consecutive night games, including four of its last five at night against Wisconsin (2008, 2011, 2013 and the Big Ten championship game in 2014). Ohio State is 13-3 against Top 25 teams in Meyer’s five seasons in Columbus. Saturday night’s game (8 p.m., ABC-TV) is the first of four night games in a row for Ohio State.